Wood burning stoves Wakefield wide and beyond! Are you searching for wood burning stoves in the Wakefield region and have no idea where to start? Wakefield is just 9 miles (14 km) southeast of Leeds and 28 miles (45 km) southwest of York on the eastern edge of the Pennines in the lower Calder Valley, so has easy access to the Leeds Stove Centre showroom. Here, we pride ourselves on already supplying and installing a large range of wood burning stoves to the Wakefield area. We have one of the largest stocks of wood burning stoves, with choices of both traditional and modern styled stoves. Our modern and contemporary styled Yorkshire stoves look great in any home, offering not only a beautiful focal point but also a fantastic heat source. We also have a large choice of traditional stoves to choose from which are perfect for cottages, farm houses, and older properties. Using a wood burning stove is extremely eco-friendly as less carbon dioxide is released than if a tree was left to rot in the forest. Therefore, wood burning stoves are carbon neutral. Located in Pudsey, Leeds, we have built a beautiful showroom displaying our multi fuel and wood burning stoves, many of which are live. At our showroom you can get a real feel of how our stoves would appear in your home. Our knowledgeable sales team will be on standby to answer any queries that you may have. 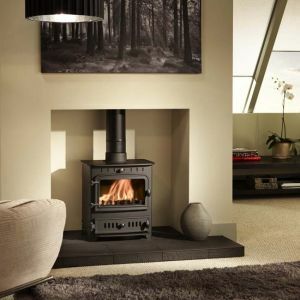 To ensure that we only supply quality wood burning stoves Wakefield and beyond, Leeds Stove Centre carefully selects the very best stove manufacturers ensuring that they meet our high standards. We stock our wood burning stoves from some of the most well know manufacturers such as Yeoman, Burley, Stovax, Dunsley, Dik Guerts and more. Providing such a wide choice of brands allows us to offer a huge choice of different designs, styles, finishes and accessories – meaning you are completely spoilt for choice at the Leeds Stove Centre. If you require a wood burning stove to be installed in your home, then please don’t hesitate to contact us. We offer a professional installation service and can not only install your stove, but also flue systems, beams, fire surrounds and hearths. All our engineers are HETAS Registered. Why Use A HETAS Approved Engineer For Installation Of Stoves West Yorkshire Wide? HETAS registered installers are trained and assessed as competent in fitting wood burning stoves Wakefield wide and beyond. If you don’t use HETAS registered installers, in the event that you have an accident involving your flue or appliance then your house insurance may not be valid. Any guarantee on a solid fuel appliance is likely to be invalid unless installed by a competent HETAS Engineer. Installations of solid fuel and wood biomass appliances are subject to the requirements of Building Regulations and are notifiable to the Local Authority in your area by English law. HETAS registered installers can self-certificate their work thus avoiding the need for costly and time-consuming Building Notice applications to the local Building Control Department. If you would like to view our range of stoves West Yorkshire based, or arrange one of our free installation surveys for a wood burning stove, please contact us at Leeds Stove Centre on 0113 255 5622 or through our website at https://www.leedsstovecentre.co.uk/.